Psychologist Kenneth B. Clark is best known for his studies on race relations, most of which were conducted with his wife, psychologist Mamie Phipps Clark. While working at City College of New York they developed their famous "doll tests," in which children were given black and white dolls to play with, and asked to indicate which dolls they would prefer to play with. The tests were administered to children in several communities of differing economic and racial complexion, and the results showed that regardless of community, black children identified with the black dolls, but that children of either race tended to view the white dolls favorably and the black dolls unfavorably. Clark's results were published in a 1950 paper, "Effects of Prejudice and Discrimination on Personality Development," in which he concluded that institutional discrimination, including racial segregation in public schools, was harmful to the personality and psychological development of black children. His paper on the "doll tests" was cited by the US Supreme Court in its landmark 1954 ruling, Brown v. Board of Education, which formally ended racial segregation in American public schools. Throughout his career, Clark worked for reorganization of public schools to remove race-related barriers to education. His 1963 collection of interviews with Martin Luther King, Malcolm X, and James Baldwin helped establish these Black leaders on the national stage, and his 1965 book Dark Ghetto spotlighted the problems of inner city slums. In 1946, Clark and his wife established the Northside Center for Child Development, offering psychological services to poor and black children of Harlem. 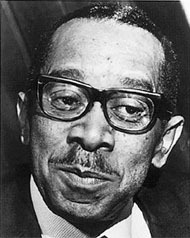 He was the first Black professor to gain tenure at the City College of New York (1960), the first African-American elected by the New York legislature to serve on the State Board of Regents, which oversees public education in the state (1968), and the first Black elected President of the American Psychological Association (1971). Toward the end of his life, Clark said he had never been encouraged by the rise of Blacks in entertainment, sports, and public life because it had no perceptible effect on the condition of ordinary and poor Black people. In a 1992 interview, when Clark was 78 years old, he said: "I am pessimistic and I don't like that. I don't like the fact that I am more pessimistic now than I was two decades ago."